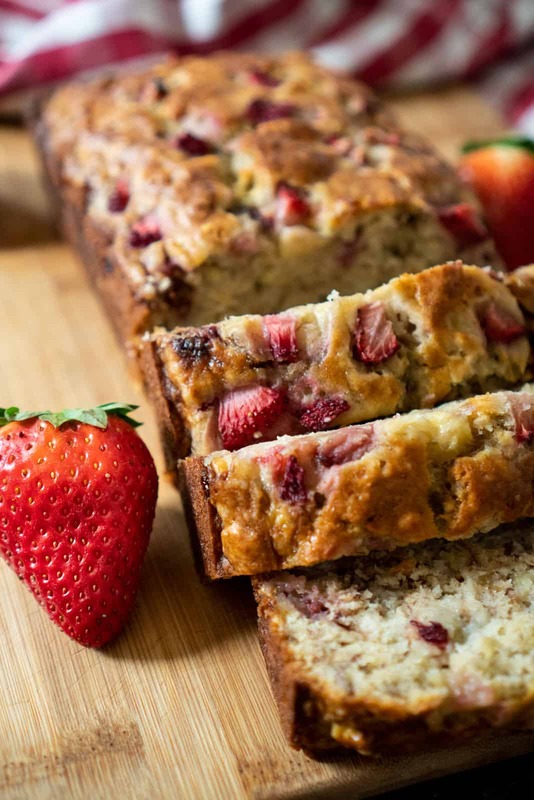 I first posted this recipe for Strawberry Banana Bread in 2013 and it has been a family favorite ever since. Our family always has both strawberries and bananas in the house so it’s in pretty regular rotation. I try to keep some sort of homemade bread or muffins in addition to fruit in the house all the time to help feed our three boys who have some pretty impressive appetites. 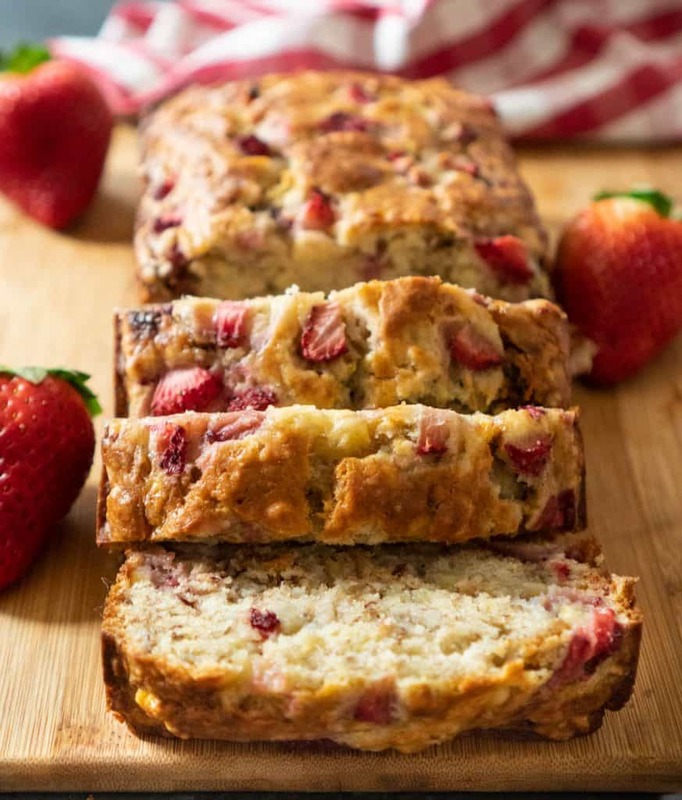 This Strawberry Banana Bread is very easy to make. It stirs up easily by hand, no mixer required. It tastes wonderful warm out of the oven and keeps for three days in an airtight container (although it rarely lasts that long at our house!) My husband likes to eat it warm with a little butter on it and I even let the kids have it for breakfast too! 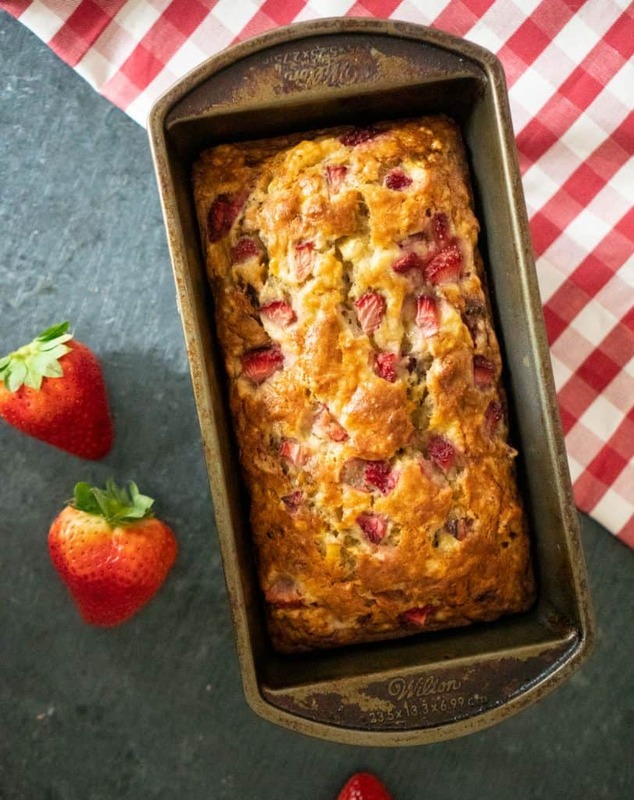 This Strawberry Banana Bread recipe is very easy to make, ready in just one hour, and bakes up perfectly every time! A true family favorite recipe! Mash ripe bananas with a potato masher or fork. Add the flour, baking soda, salt, and mix well. Pour mixture into a buttered 4×8 inch loaf pan. Bake for 50 minutes or until toothpick inserted in the center comes out clean. Cool on a rack. Keep in an airtight container up to three days. For a pretty presentation, reserve some chopped strawberries and add on top of the bread after pouring batter in the pan. Tap strawberries gently into the batter before baking. YUM – that bread looks SO good! Pinned to make soon! I found your recipe at the What’s Shakin’ party! Looks amazing! Thanks Becca, it was devoured pretty quickly here! One of my favorites! 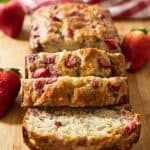 Strawberry bread is so delish! My husband and boys devoured mine!! I got one slice though, it was so good! It’s so good, let me know if you try it out! Looks delicious! Going to try this weekend! Yummy!! Pinning this recipe! Thanks so much!! Ohmygoodness … that looks delicious! My son would hide all of it so that he could enjoy all by himself! Thanks for sharing the recipe, too! Happy day. This bread looks amazing, I’m pinning this to try sometime! Thanks for sharing this. I’d love for you to share this amazing recipe on my Sweet Tooth Tuesdays blog link party.